The year of 2016, there were a total of 1,059 tornadoes across the U.S. (with the month of May, 2016 having some of the more photogenic tornadoes). How does this compare to other years? According to the 2005-2015 tornado climatology, there was an average of 1,402 tornadoes across the nation. Tornado activity for 2016 was below the 2005-2015 average. Each year, there are about ~100,000 thunderstorms that occur in the United States. Of these ~100,000 storms, only about 10.0%, or ~10,000 thunderstorms, reach severe limits (≥58mph winds; ≥1.0″ diameter hail). Within these ~10,000 severe thunderstorms each year in the U.S., about ~1,000 of them produce tornadoes, according to tornado records dating back to the 1950s. 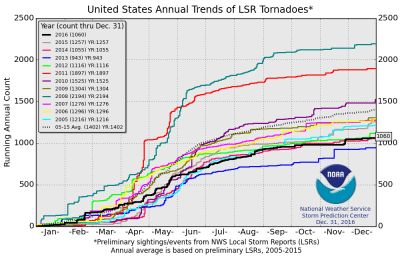 Tornadoes were reported each month in 2016. The most active months for tornadoes were May, April, and August, respectively; with more tornadoes occurring in May than any other month. All but 7 states had tornadoes, and the states that did not have reported tornadoes were: Alaska, Connecticut, Delaware, Hawaii, Nevada, Rhode Island, and Vermont, and The District of Columbia. Below is a chart that shows the number of tornadoes per month, in addition to the number of severe hail (≥1.0″ diameter) and severe wind (≥58mph) reports per month. Out of the 1,059 total tornadoes in 2016, there were only two violent tornadoes (EF-4+ intensity on the Enhanced Fujita Scale). Both of these violent tornadoes were surveyed to be EF-4 rated (winds of 166-200mph). There has not been an EF-5 (>200mph) rated tornado since Moore, Oklahoma, EF-5 tornado on May 20th, 2013. The first violent tornado of 2016 occurred on May 9th, 2016, near Katie, Oklahoma. According to the damage survey conducted by the National Weather Service in Norman, Oklahoma; the EF-4 tornado had estimated winds of 166-175mph. The second EF-4 tornado to occurred 16 days later on May 25th near Solomon and Chapman, Kansas. This was a long-track tornado that had a life time of 90 minutes, and moved 26 miles across north-central Kansas. A brick-framed home was completely destroyed and several meters of railroad tracks were bent by the tornado. Winds within the tornado were estimated by National Weather Service damage surveys to be 180mph. Image of the Solomon-Chapman, Kansas, EF-4 tornado that occurred on May 25th, 2016. Image credit: Ruffin McDaniel, and is of public domain use under Wikipedia as it was included in the National Weather Service damage survey. Below is a chart that depicts the top-10 active tornado days for 2016. Note that it is exclusive of the intensity of tornadoes; rather, the number of tornadoes that occurred in one day. As mentioned above, all but 7 states experienced tornadoes this past year. Tornadoes can, and do, occur outside of the traditional Tornado Alley across the Great Plains, as well as Dixie Alley, the “second” Tornado Alley across portions of the Deep South. One of the more memorable days from the 2016 convective season, as agreed upon among those throughout the weather enterprise, was the outbreak of tornadoes in western Kansas on May 24th. 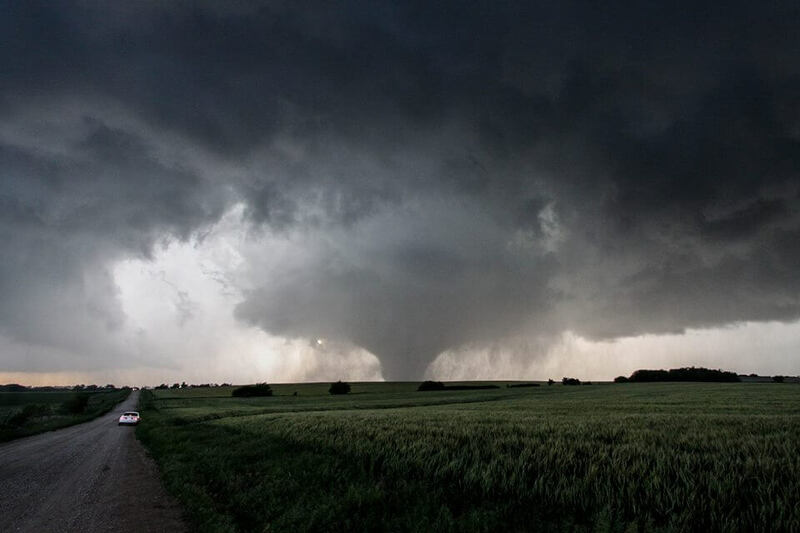 A supercell near Dodge City, Kansas, produced 13 highly visible tornadoes, including a long-track tornado that had a damage path surveyed at 17 miles in length, and was rated as an EF-3. Other supercells produced tornadoes across the western part of the State of Kansas as well, with 33 tornadoes occurring on May 24th.